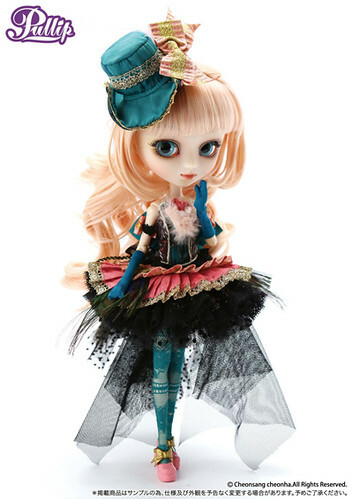 I was about to blog the newly announced September Pullip releases when I realized that somehow I never blogged the August Pullip releases. 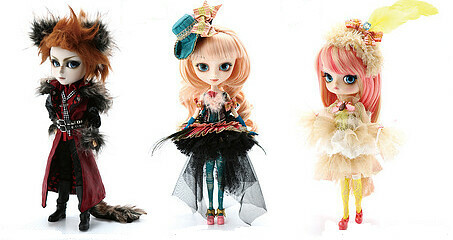 Three dolls have been announced for August: Pullip Io, Dal Loa and Taeyang Valko all three of the releases have an animal theme this time around (some more subtle than others). Like the blue sky, Like the green forest, Like the pitch black night… Wearing colors and stepping out with excited… Feel Like So. 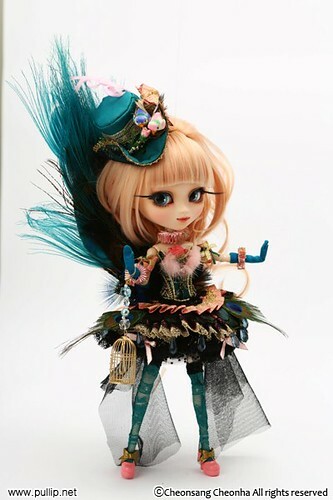 Pullip Io has a peacock motif. 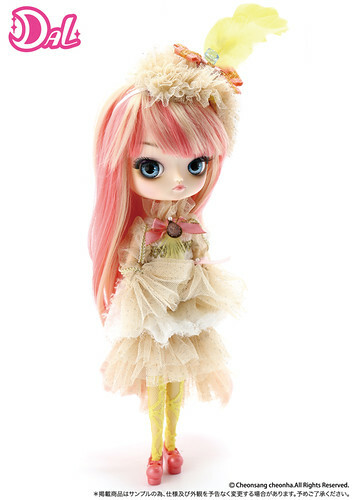 Her MSRP is 14,700 Yen but you can preorder her at Pullipstyle for a bit cheaper than that- here. I actually quite like her, she reminds me a bit of Aquel almost like a grown up version. 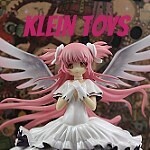 She lost a lot of zest compared to the prototype but she is still a gorgeous doll. The original prototype picture for anyone curious, I assume it would have been too cost prohibitive to produce her in the more elaborate stock. She certainly looked more like a peacock in the prototype. Peerow…..Peerow…. I’m a singing bird…. I am going to wait for you again today and sing!! Dal Loa has a canary theme. 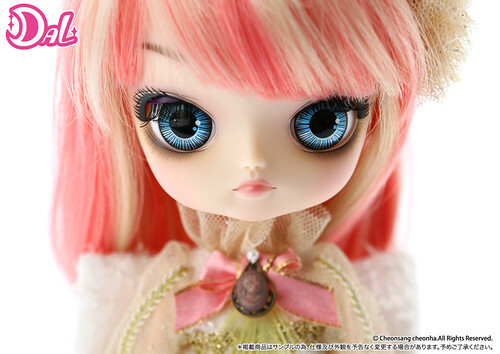 Her MSRP is 14,700 yen but is available at Pullipstyle for a bit cheaper – here. The original prototype looked a lot more polished but I find that the I like the dal itself better in the release version even if I prefer the prototype’s stock. I’m going to be strong under the white moon in the night…. See, here I am. Taeyang Valko is a wereworlf- scary! 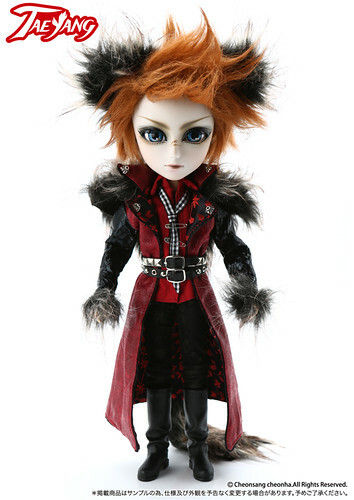 His MSRP is 16,800 yen so he is a bit pricier than the girls, he is available for preorder at Pullipstyle – here. I’m actually really impressed with Valko, I love his stock and all the little fur touches (hopefully faux fur) and the scar on the nose is just perfection. If I collected boys he would be a must have! 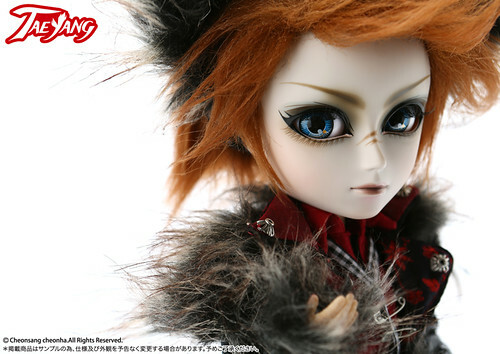 This entry was posted in Dal, Doll, Pullip, Taeyang/ Namu and tagged big bad wolf, Dal, io, loa, Pullip, taeyang. Bookmark the permalink. Ha! This is a perfect example of what we were just talking about in your previous post. When they released the pictures of the prototypes for Loa and Io I knew I had to have them. I was even happy to spend more on them if they could keep them close to the prototypes. But they made major changes to the dolls and I have to admit it makes me a bit sad. That said, I stll think they turned out lovely and I agree some of the new details are better. In the end I think the vision they were going for really won me over and I hope to preorder them both. 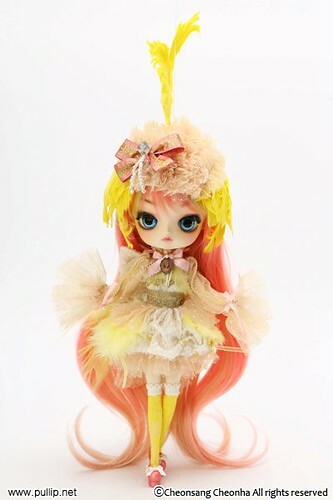 Also seeing as this is supposed to be inspired by the Greek gods I would love to see a Medusa Pullip… I know a bit far fetched for this line but you can dream right.